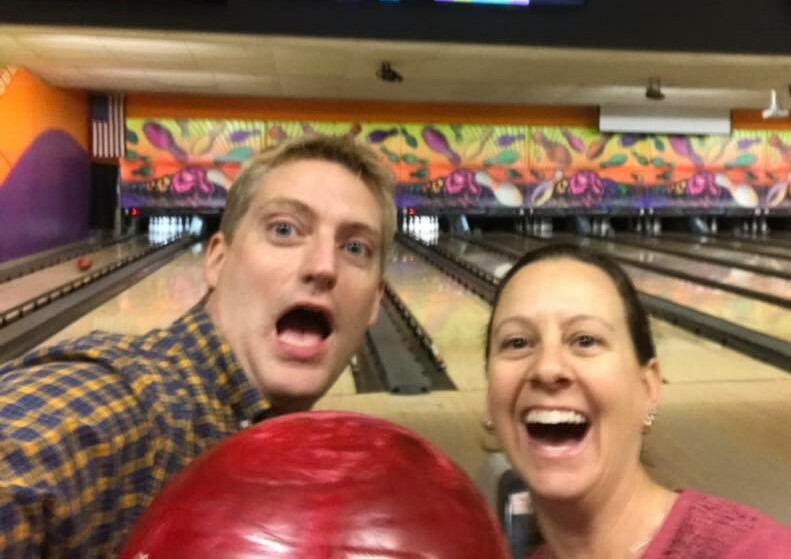 A big KUDOS to Jesse and Diana for representing the Rotary crew at Big Brother Big Sister of Vermont's fundraising bowl-a-thon event! 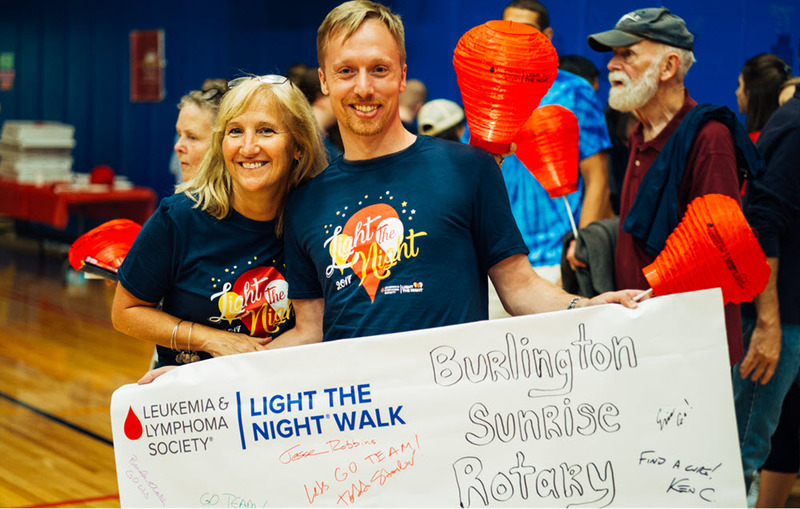 Light The Night 2018 A Big Success! Once again, Laura led our Light The Night efforts for 2018. Friday's march was another wonderful event. Let's Rally for Light The Night 2018! 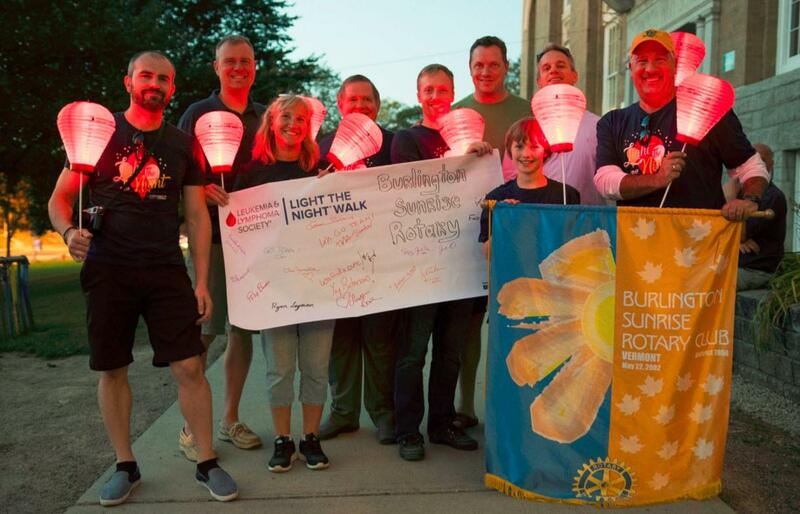 It's that time again -- time to support LIGHT THE NIGHT and their fight against Leukemia and Lymphoma! 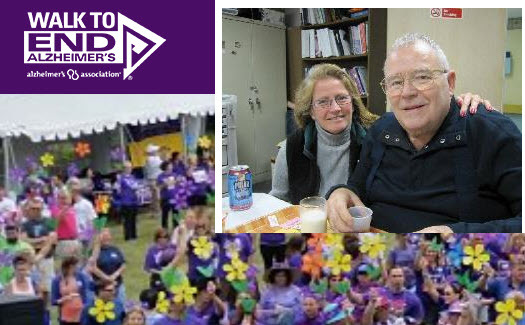 Please visit Nikki's fund raising page to help end Alzheimer's. Today we were lucky to meet with adult mentors and one student from the Pan-African Youth Leadership Program. This Sunday marked the 12th year of Burlington Sunrise Rotary supporting the Lake Champlain Dragon Boat Festival. As usual, we supplied dock volunteers to assist boaters and ran our food table to raise funds for Rotary charities. This Friday we were joined by District Governor Larry Vars, his wonderful wife Joan Vars, and Assistant Governor Sandy Walsh (S. Burlington). Thank you Linda for visiting our club and educating us on grass driveways and other was to better plan land use and improve water quality. 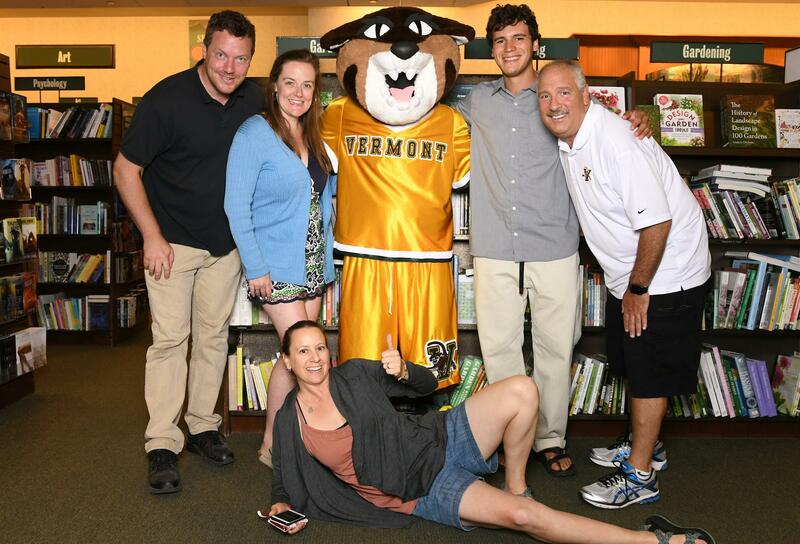 Today, in partnership with Barnes & Noble, we conducted our first annual Bookfair for Imagination Library VT! Eric H., Ryan L. and Todd S. receive our Imagination Library donation check from the Lake Monsters. 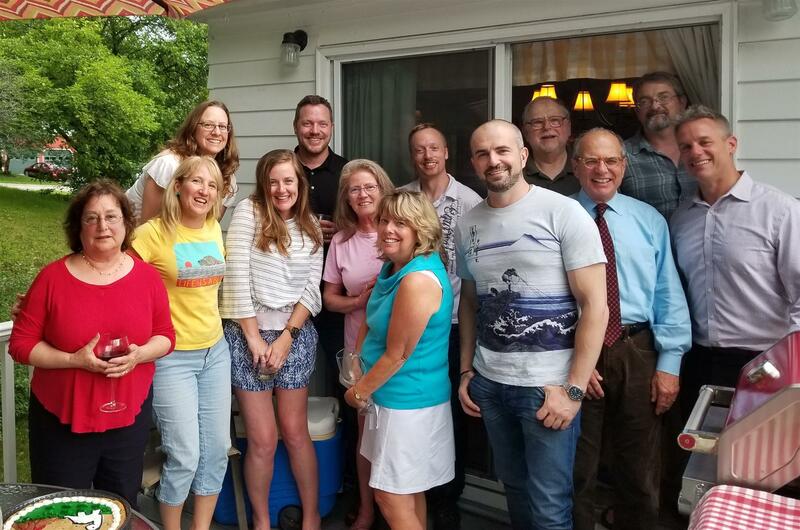 Christine Frenette once again hosted a wonderful Transition Party to celebrate the passing of the Presidential Torch from Todd Stoilov to Eric Hanson. A hearty THANK YOU to Erin Alamed and Terry Pomerleau of the Humane Society of Chittenden County for visiting us today. 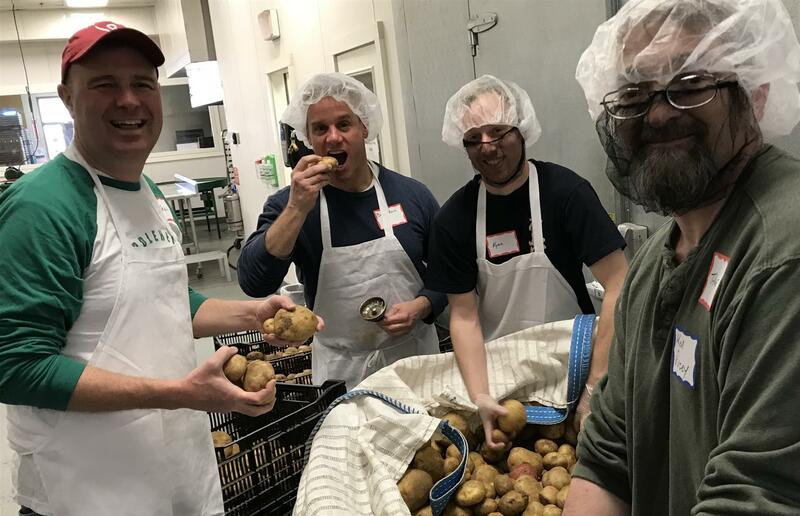 Rotarians pitch in by cleaning, inspecting, trimming and packing produce at Salvation Farm's processing facility in Winooski. 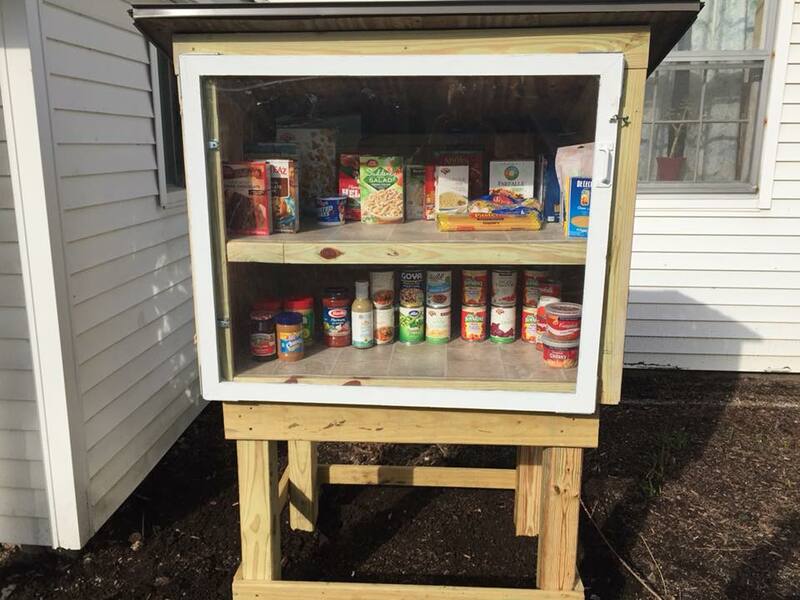 Our first Little Free Pantry is LIVE! We are VERY PROUD to announce that our first Little Free Pantry is live and well thanks to the hard work of Phillip Bosen, Andy Duback, Julie Kelly and other Rotarians!!! Today we welcomed new member Bobby Ibarra! A hearty THANK YOU to John Thomas of the Vermont Association for the Blind and Visually Impaired for visiting us today. John's organization is doing wonderful work tackling the social hurdles incurred by the blind, as well as assisting visually impaired individuals stay self sufficient. Today we had the good fortune to be visited by Chris Powell, CEO of Aspenti Health. 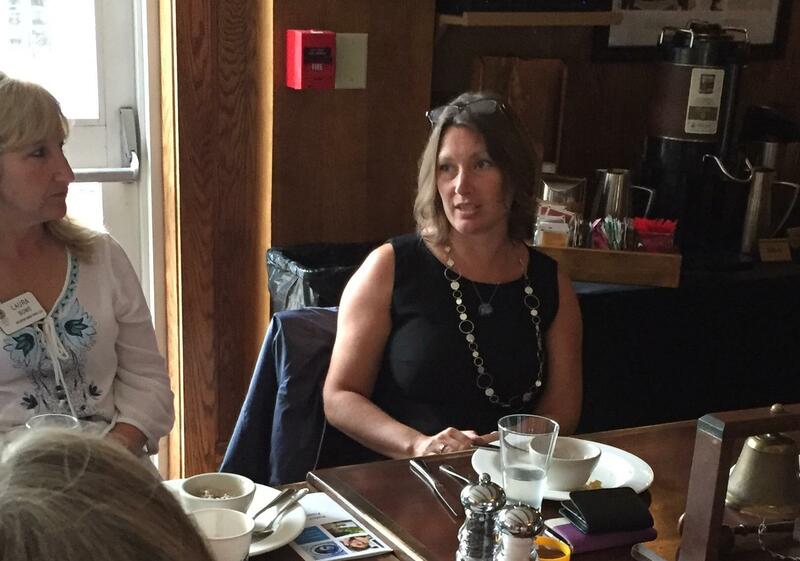 This week were fortunate to be visited by Elizabeth Sightler, Executive Director of Champlain Community Services. Following last Saturday's UVM Women's Basketball event, our good friends Sue Minter and Deb Lamden from Partners in Adventure visited us again today to update us on PiA's plans for 2018. 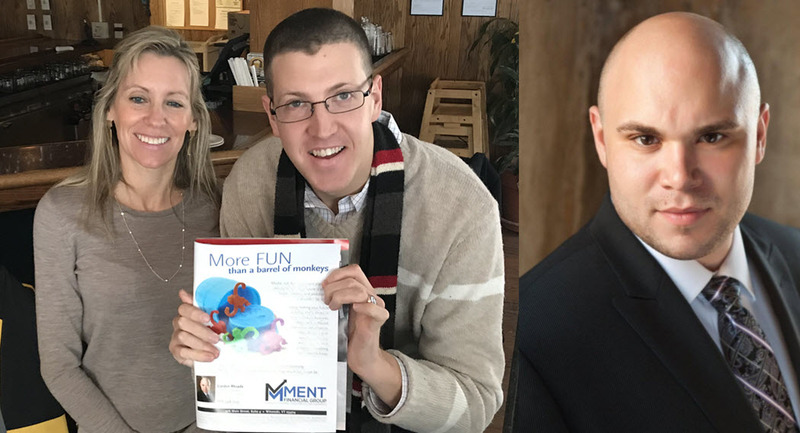 New Members: Welcome Julie, Alex and Gordon! Today we are proud to announce three new Burlington Sunrise Rotary members: Julie Gaboriault, Alex Brett (center) and Gordon Rhoads (right). 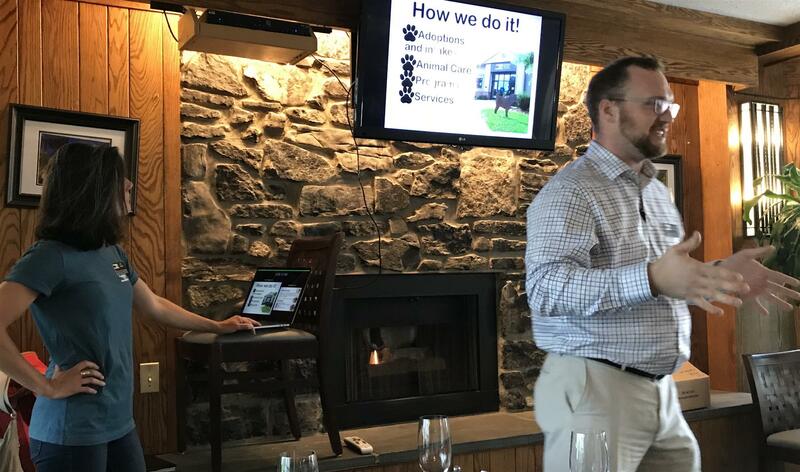 Julia Scheier, Operations Director for Salvation Farms, stopped by to provide another update on the progress they are making building increased resilience to Vermont's food system through agricultral surplus management. 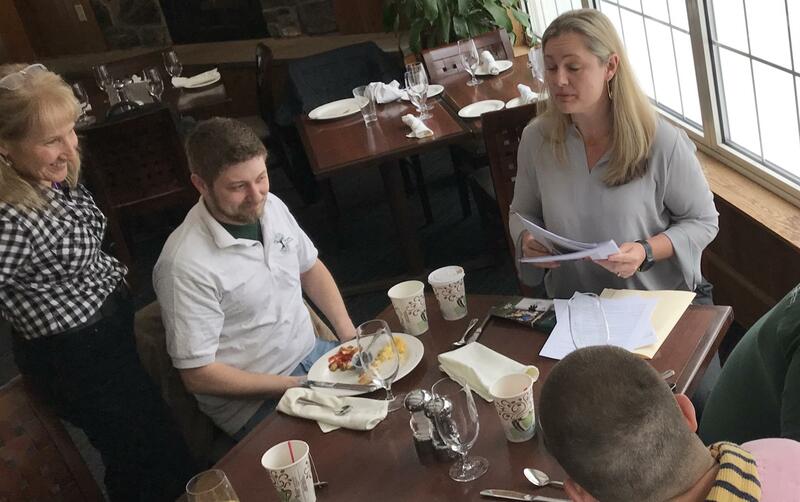 Our friend Kimberley Diemond from VT Big Brothers Big Sisters once again visited our Rotary club to update us on BBBSVT's latest progress. We joined forces with Kiki Leech from Colchester-Milton Rotary Club to help with her "My Wet Shoes" program at the Champlain Elementary School. Trotting of the Turkeys 2017: Another Rousing Success! Our fourth Trotting of the Turkeys was another rousing success! Led again by Steven Gentile, more than 50 turkeys and over $10,000 were donated to the Chittenden Emergency Food Shelf! 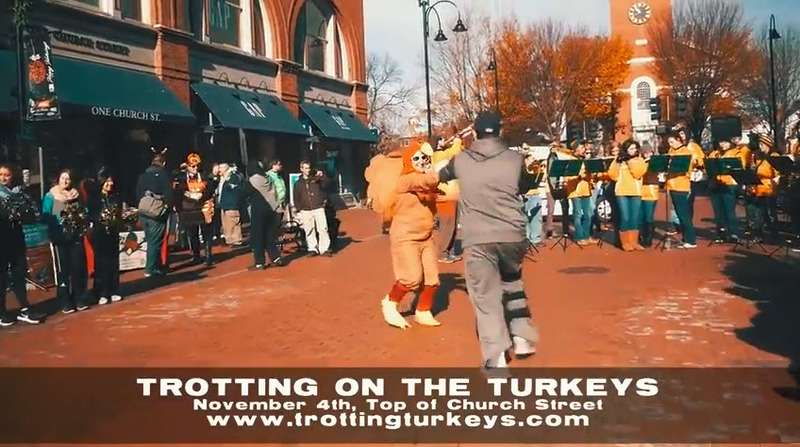 Trotting of the Turkeys is Almost Here! Buy your tickets (donations) NOW for the 2017 TROTTING OF THE TURKEYS, occuring Saturday, November 4th on Church Street!!! 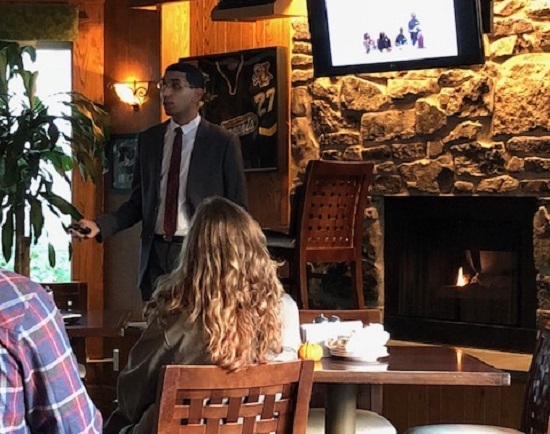 Dr. Naiim Ali from Imaging the World visited our club Friday to discuss their important global work of saving lives, one ultrasound at a time. Thank you, Naiim, for visiting with us! 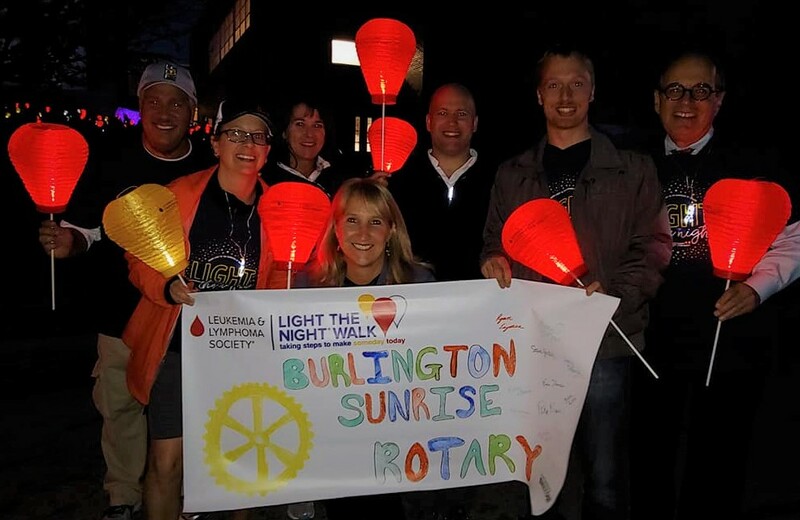 Friday marked another great Light The Night march in downtown Burlington to raise funds for the Leukemia & Lymphoma Society! Miss Vermont Erin Connor visited with us before piloting a plane to New Jersey for the Miss America Pageant. Yes, Erin is a licensed pilot, which is part of her promotion of STEM, a program that gets girls and young women interested in careers within Science Technology Engineering & Mathematics. New 2017-2018 District 7850 Governor Eric Denu visited our chapter this Friday. 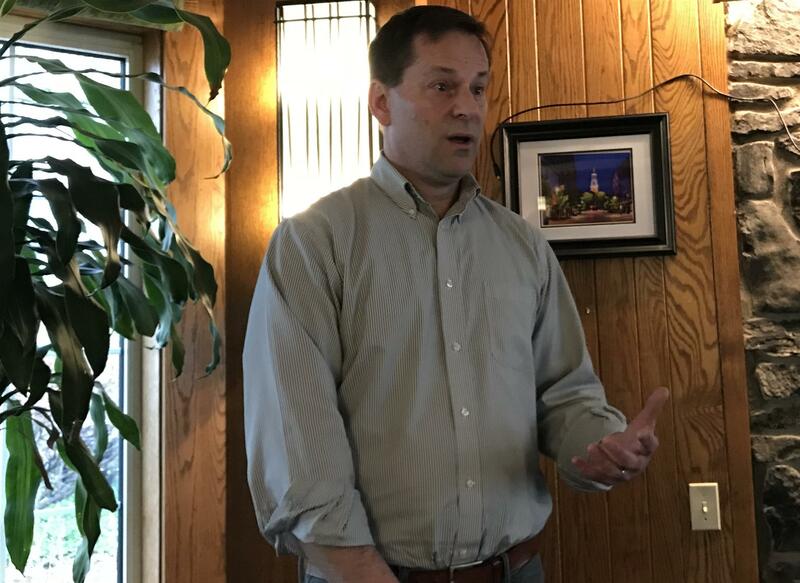 Eric shared his family's history with Rotary, discussed the importance of teamwork, announced the upcoming Rotary 5-District Summit and presented us with a nice gift. The Williston RC was our gracious host Thursday as we conducted a three-way club meeting that also included the South Burlington chapter. It was a beautiful morning out on the lake front today as Burlington Sunrise Rotary helped support the 2017 Dragon Boat Festival for the 12th year in row. The club was split into two teams: one that worked the docks, helping teams in and out of boats. Thanks to Steve Gentile for leading the dock effort, in some cases for all three days of the festival. 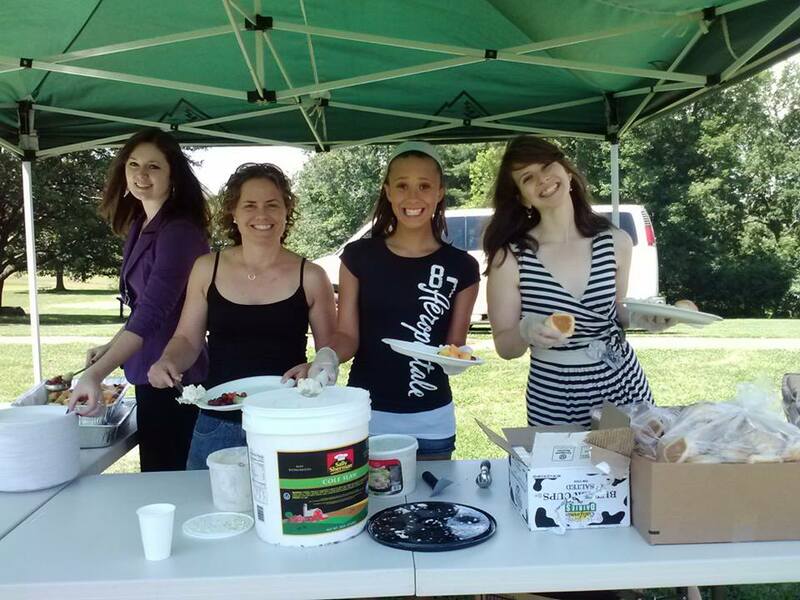 The second squad worked the food table on Sunday, selling bagels, donuts, hot coffee and fruit for Rotary charities. Thank you Eric Lafayette for leading the food table. Good times were had by all at the joyful Changeover Party at Chris & Paul Frenette's house. A peaceful and productive Presidential changeover occurred as Julie passed the presidential baton on to Todd. Jake Elliott from SunCommon spoke with us Friday about the advantages of going solar. In addition to reducing our carbon footprint, Solar energy can be a positive investment, saving you money on you monthly electric bills while also adding significant value to your home. Their local financing allows Vermonters to go solar with no up front cost making it easy and affordable for everyone. 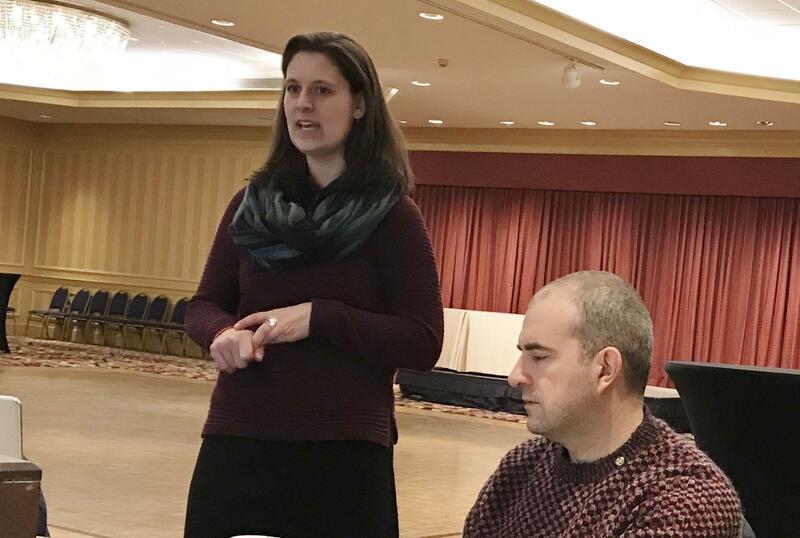 Kimberley Diemond from Big Brothers Big Sisters of Vermont visited our Rotary Club this morning to discuss how local Big Brother Big Sister chapters are consolidating into one Vermont organization. The Burlington Sunrise Club is proud to welcome new member Gail Deuso! Welcome Gail! That's Gail on the right in the picture above, with her sponsor Laura Bowe and President Elect Todd Stoilov. "65,000 Americans died from Opiate use this past year" stated Burlington Police Chief Brandon del Pozo. 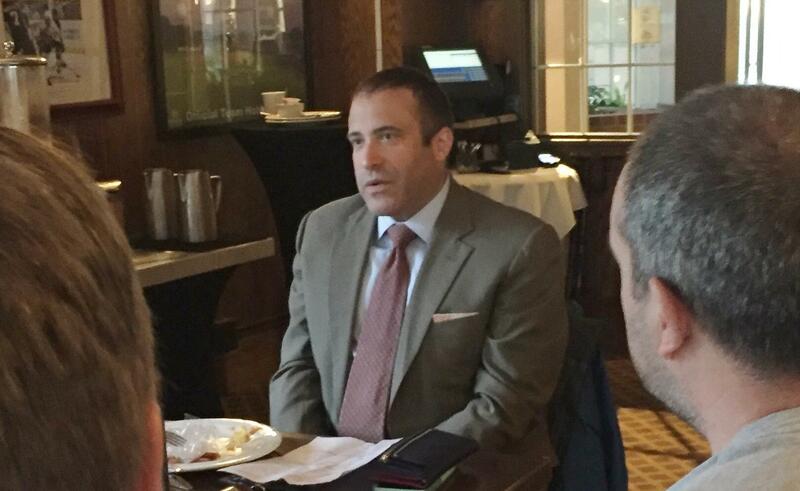 Our club was honored to host Chief del Pozo on Friday, June 16th. The Chief took time out of a very busy day to discuss the current Opiate Crisis here in Vermont and across the country. He added that we as a country must go back to Word War II to find that type of annual American death toll from one source. 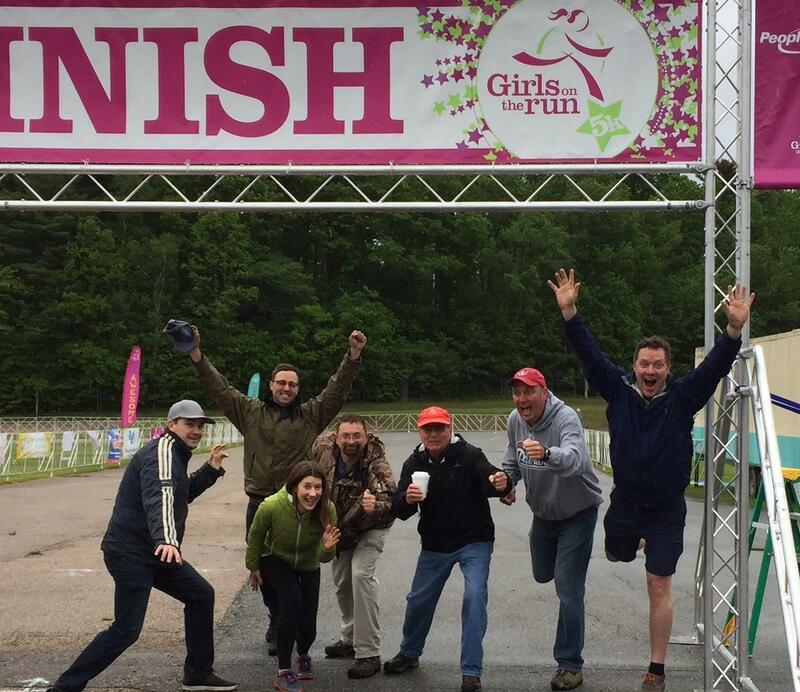 Seven Rotarians put the "sunrise" into Burlington Sunrise Rotary Club with a 6am to 8am volunteer sessions this Saturday morning to help set up the Northern Vermont Girls on the Run/Walk 5K. 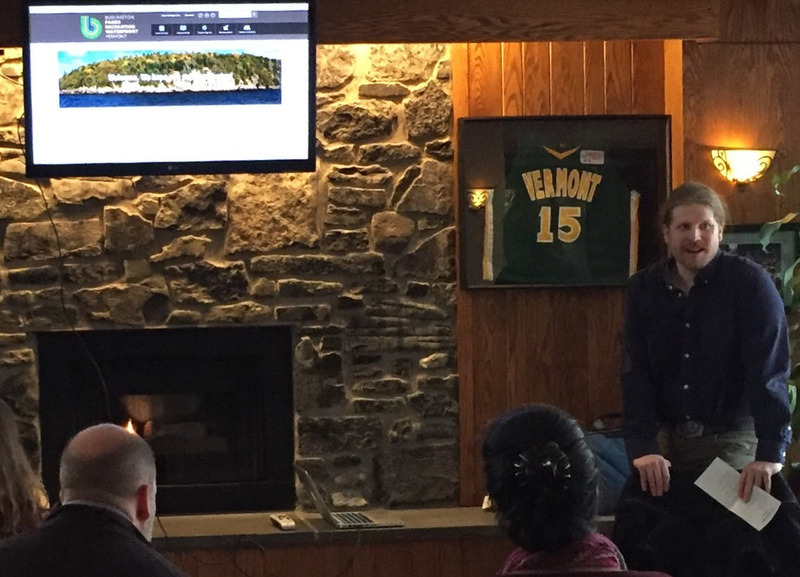 Kyle Bostwick, VP of the Vermont Lake Monsters, paid our Rotary club a visit this morning, encouraging us to root, root, root for the home team and visit the Vermont Lake Monsters this summer. 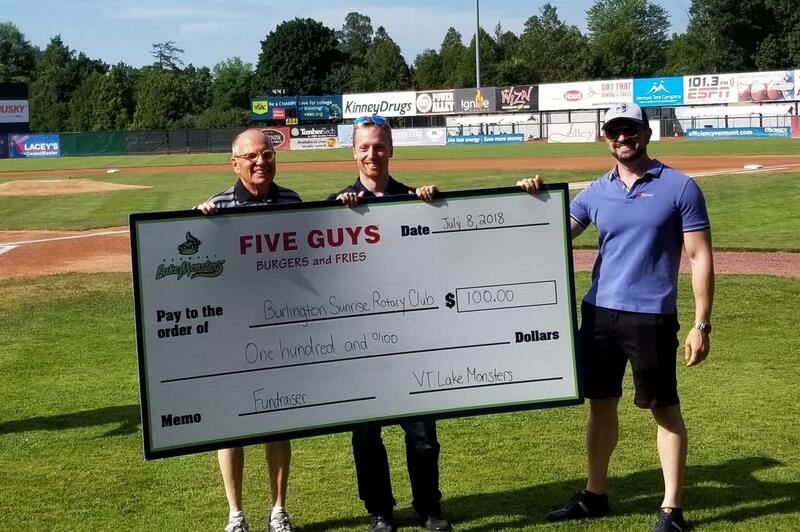 The Lake Monsters, an A-Ball Affiliate of the MLB Oakland A's, are Vermont's only professional team, drawing fans from all 14 Vermont counties. The Burlington Sunrise Rotary Club is proud to announce that Ryan Layman has officially joined the club! Welcome Ryan! That's Ryan above with Club President Julie Kelley (left) and his club sponsor, Laura Bowe (right). It was a beautiful Tuesday evening along Lake Champlain just off North Avenue. Ten Rotarians showed up to plant trees along an attractive park entrance to the bucolic lake path. 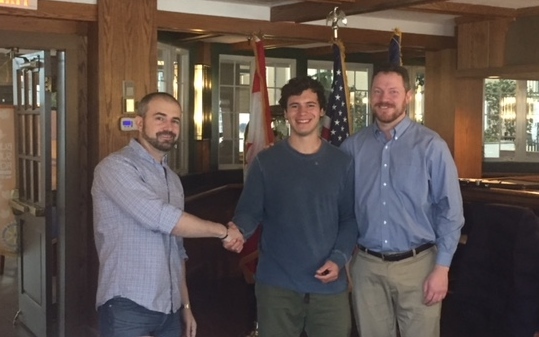 A big hearty welcome to Jesse Robbins, who as of today officially joins the Burlington Sunrise Rotary club. Welcome Jesse! 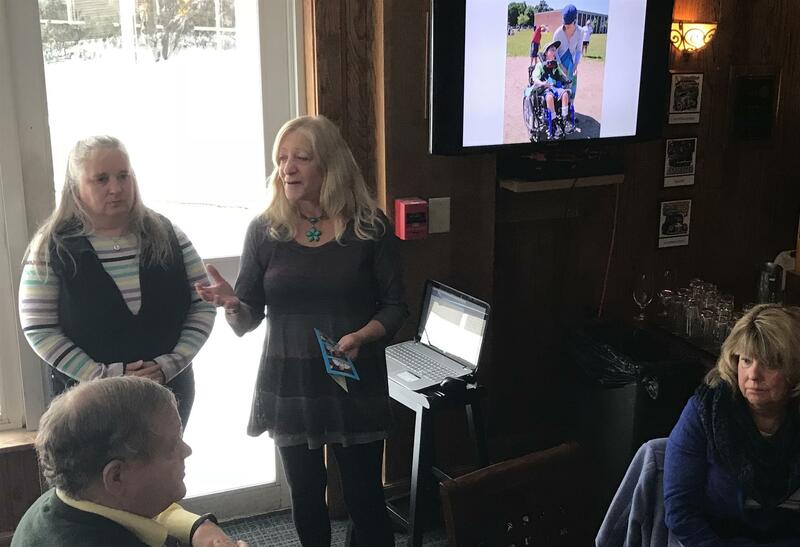 Jane Mitchell (left), Development Director for the Vermont Chapter of the Alzheimer's Association (and fellow Rotarian), spoke to us Friday about the group's efforts to fight the brain disease and assist family members supporting Alzheimer victims. 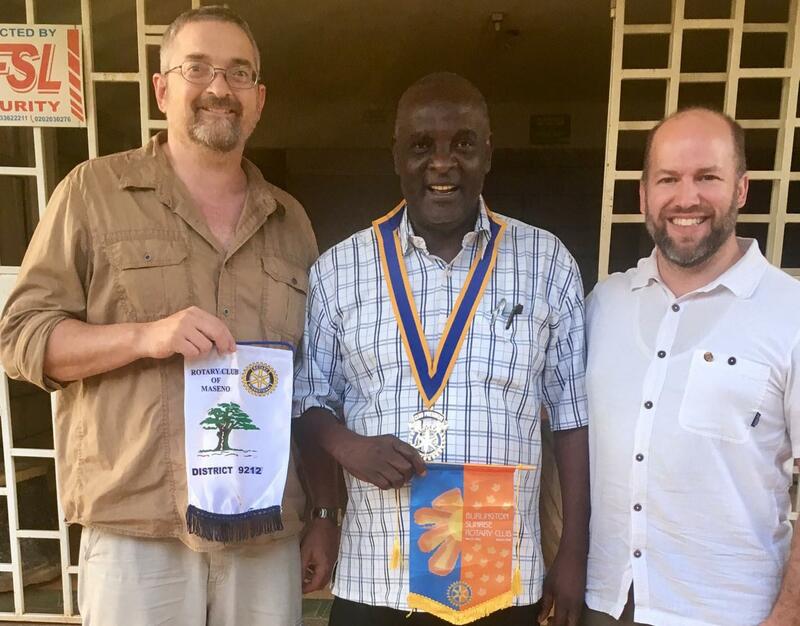 Over the past seven months, Rotarians Ken Puzey, Nicola Elkins and Phillip Bosen traveled to Kisumu Kenya to further advance efforts to deliver safe drinking water to the people of Kenya. In November of 2016, Ken and Phil visited Kisumu to kick off the purchasing of raw materials for additional solar boiler panel construction. The Safe Water Project was able to buy materials due to a very generous donation from the Canadian Rotary District 7040, which Nicola helped lead. 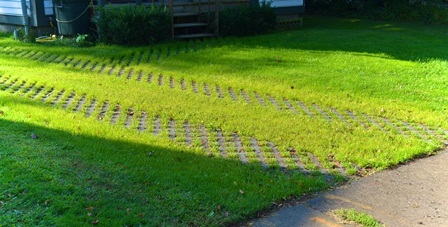 The generous donation will lead to the production of 260 solar water biolers at a cost of $77 each. 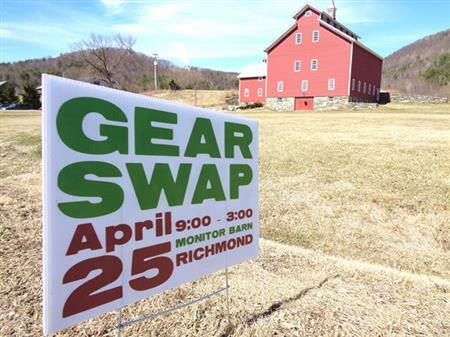 The Logger, Rusty DeWees, helps introduce this year's Gear Swap! New Members: Eric and Diana! 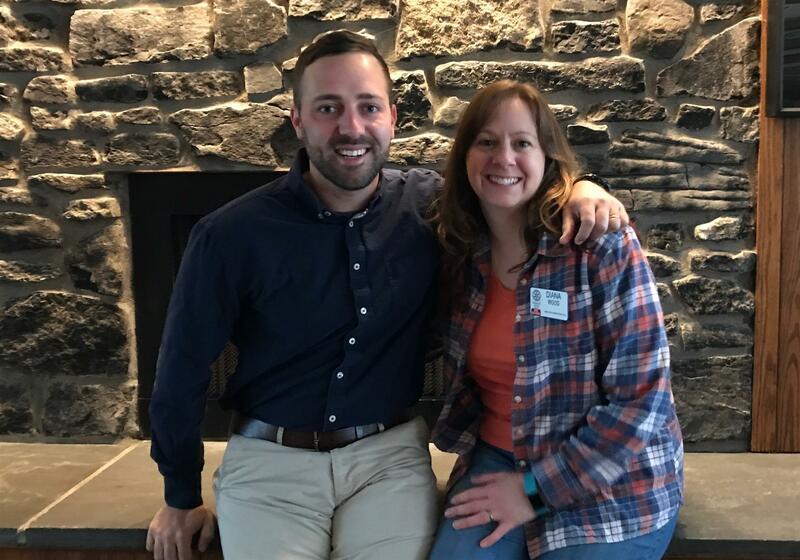 Welcome Eric Lafayette and Diana Wood to the Burlington Sunrise Rotary! Today we had the pleasure of hosting Dan Cahill from Burlington's Parks and Recreation department. Per Dan's presentation and the Parks & Rec web site, "The Department of Parks, Recreation and Waterfront oversees all of Burlington’s 35+ Parks, 550+ Acres of Open Space, 4 Public Beaches, Street Trees & Greenways, Community Gardens, 3 Cemeteries, Miller Recreation Center, Leddy Ice Arena, Champlain Senior Center, North Beach Campground, Community Boathouse Marina and all Recreation Programs." They manage an impressive portfolio, a vast array of assets that needs help from Burlington's residents. Today we were presented an award from the Leukemia & Lymphoma Society. Gail Deuso (Vermont Coordinator), Maureen O'Brien Thornton (Executive Director), and Jen S. McGarry (Director, Patient Access Volunteer Development) from The Leukemia & Lymphoma Society Upstate New York/Vermont Chapter graciously delivered our "Top Corporate Fund Raising" award for raising funds for the past fall's "Light the Night Walk". In addition to the top team award, Laura Bowe also won the award for "Top Individual Fund Raiser". Our speaker today was Chelsea Frisbee, Development Manager of the Intervale Center in Burlington. 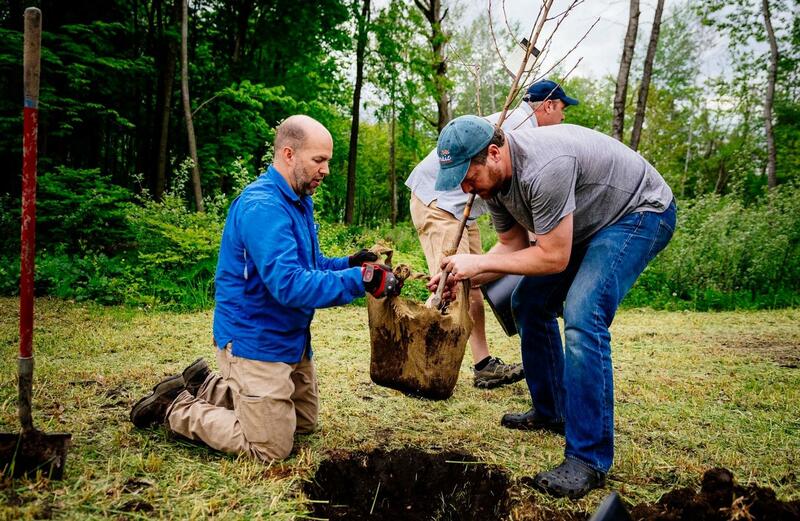 Chelsea supports the important work of the Intervale Center by managing community fundraising and events. She grew up on a small farm in upstate New York and has a passion for sustainable agriculture and food systems. 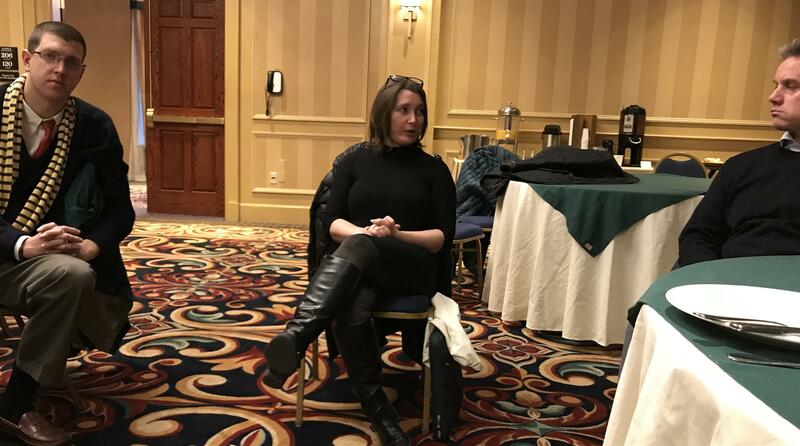 Rachel Cummings (Chief Operating Officer) and Erica Marks (Director of Volunteer Services) today shared with us the mission of Age Well VT. Rachel is a former Rotarian and Erica is currently a Rotary member at a neighboring chapter. Age Well is known for their tremendous "Meals on Wheels" work, but officially Age Well carries out "programs authorized by the Older Americans Act - federal legislation that calls for local organizations to take the lead in creating a coordinated system of services for older persons across the country," per the Age Well website. Theresa Snow of Salvation Farms, spoke to the Burlington Sunrise Rotary Club on February 17, 2017. 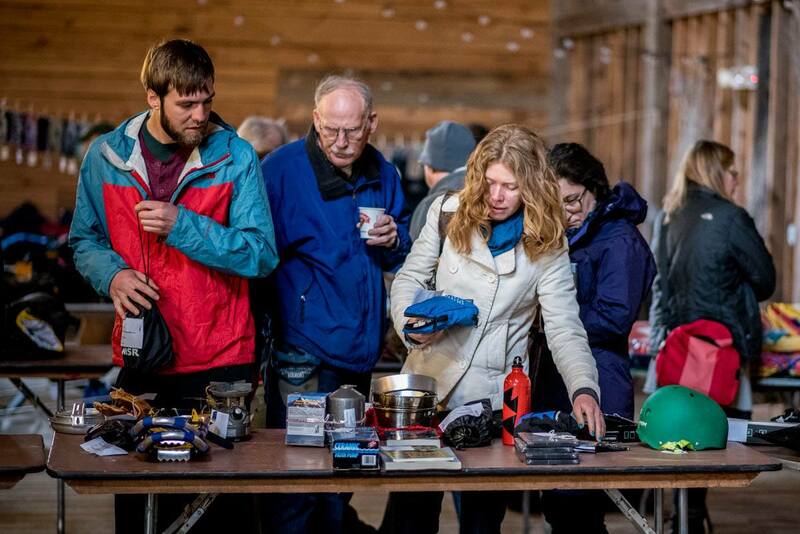 The club learned about Vermont's farm gleaning effort. Salvation Farm is not a physical farm, but a group that gleans food from farms unused harvest. Some 14.3 million pounds of food is either not harvested or is placed in storage and spoils. 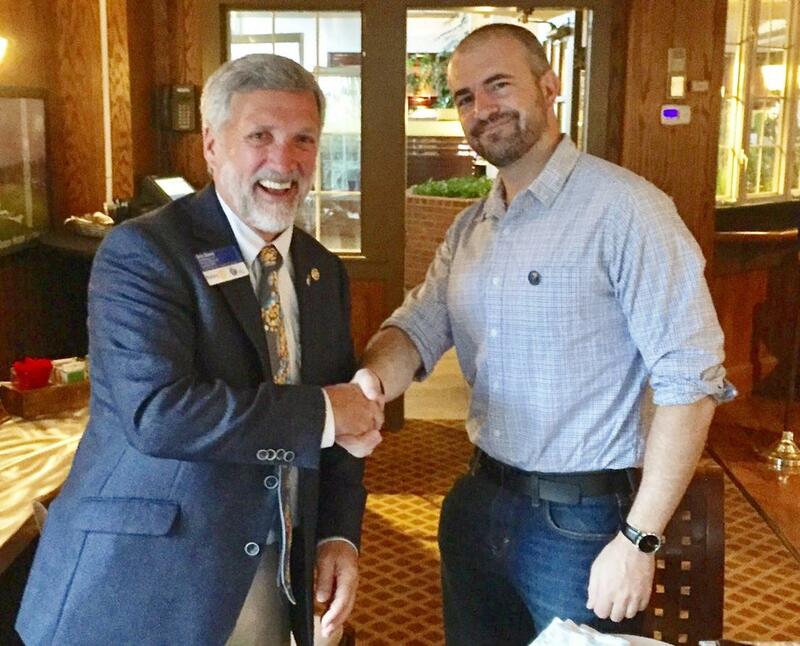 Ken Crites joins Burlington Rotary! The members of the Burlington Sunrise Rotary Club regularly serve a meal to the guests at the American Cancer Society's Hope Lodge in Burlington. Join us in service as we serve, dine with and have plenty of laughs the guests at Hope Lodge. Ken Puzey's Kisumu Kenya Safe Water Project has made tremendous strides to produce safe drinking water in Kenya. The project was initially funded by the Albert & Vivian Puzey Foundation, but over the past two years has received financial boosts from rotary clubs in Vermont, New York and Canada. Hello, Ken Crites here. In November 2016, I was just a friend of Brendan Walsh's (the Indian with sunglasses on the left) interested in Rotary. 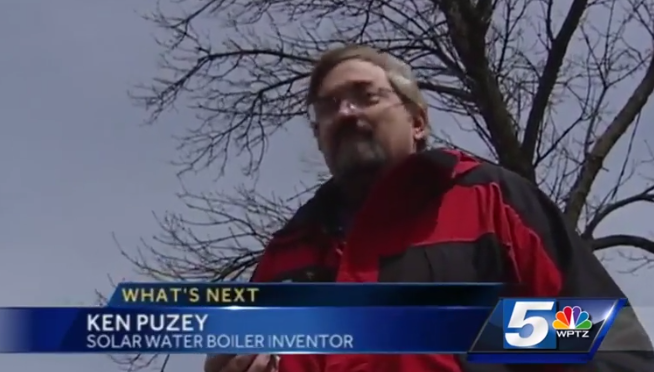 Burlington Sunrise Rotarian Ken Puzey and his Kisumu Kenya Safe Water Project was just recognized by NBC Channel 5 WPTZ! 1.1 Billion people do not have access to safe drinking water. 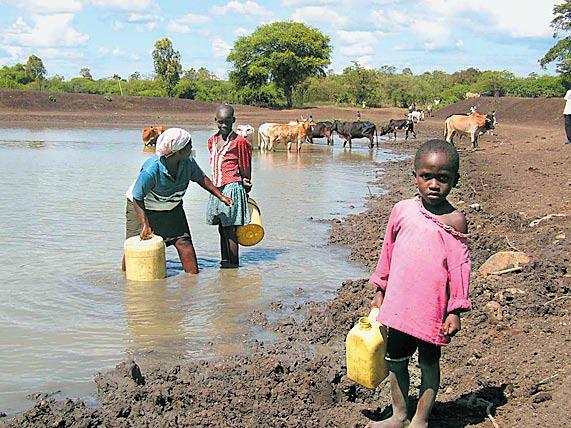 In Kenya, 1.3% of the population dies each year from drinking unsafe water. The under 5 mortality rate is 22%, with water borne illness as the leading cause of death. 3 Billion people in the world cook with wood or charcoal. 3.5 Billion tons of wood are burned every year, forcing 111,600 square miles of forest to be cut down every year (larger than state of Nevada). In Africa today, wood is consumed at twice a rate as tree growth, producing 6.79 Gigatons of carbon dioxide produced each year. 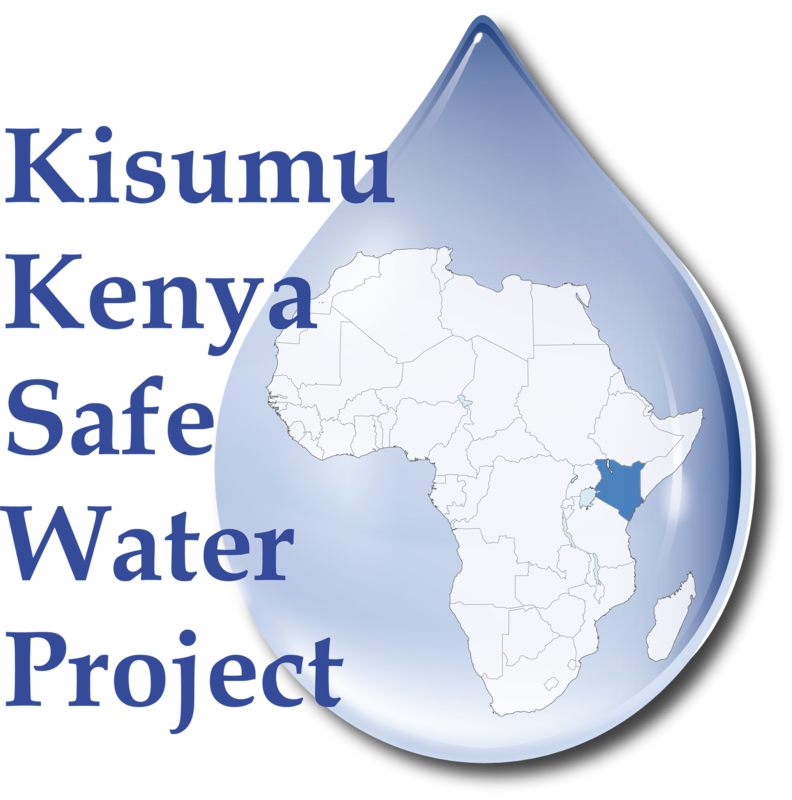 The objective of the Kisumu Kenya Safe Water Project is to provide a sustainable method of creating safe drinking water, to save lives and reduce dependency on wood burning fuel. 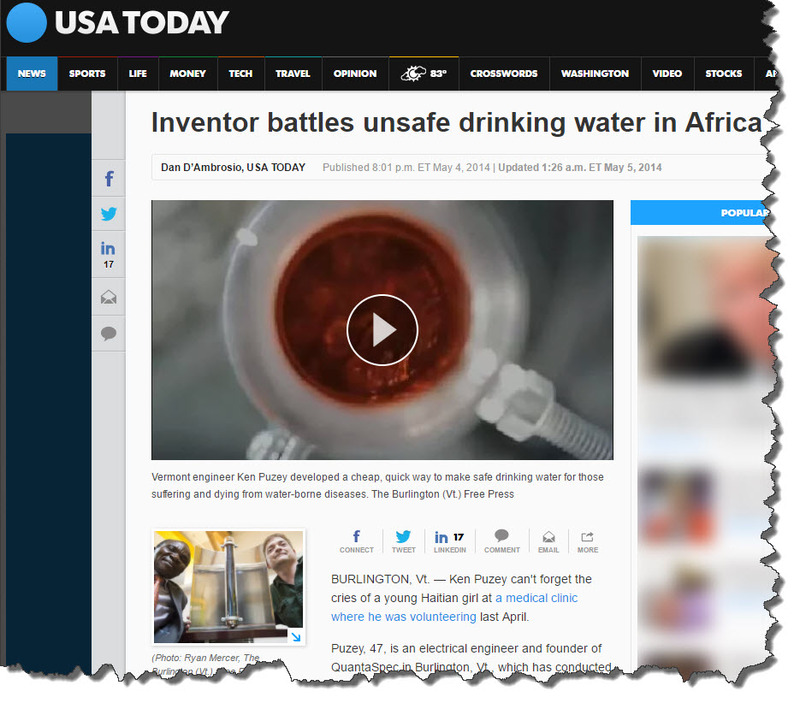 Rotarian Ken Puzey just had his hard work for safe drinking water in Kenya recognized by the USA Today! USA Today and Burlington Free Press writer Dan D’Ambrosio beautifully articulates how Ken's solar powered water boiling system can help thousands of Kenyans avoid unsafe drinking water. 1.1 billion people around the globe do not have access to safe drinking water. This lack of access results in a large disease burden with 1.7 billion cases of diarrhea annually. 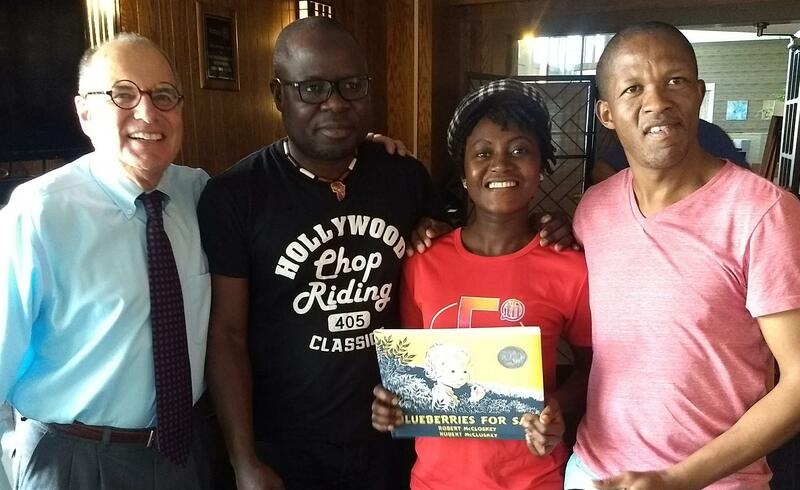 Fostering literacy in the local community remains one of our most important missions! 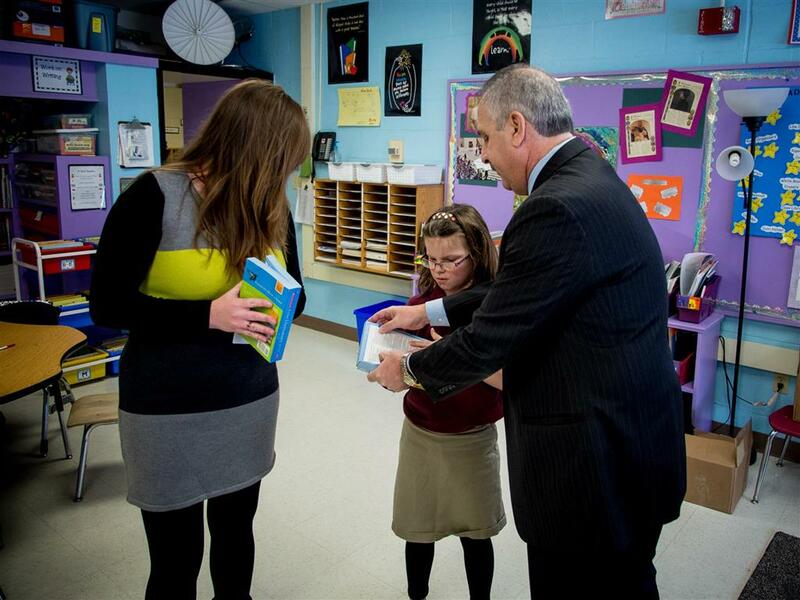 This year was the 10th year that the Burlington Sunrise Rotary Club donated dictionaries to the 3rd grade class and thesauri to the 4th grade class at Christ the King. 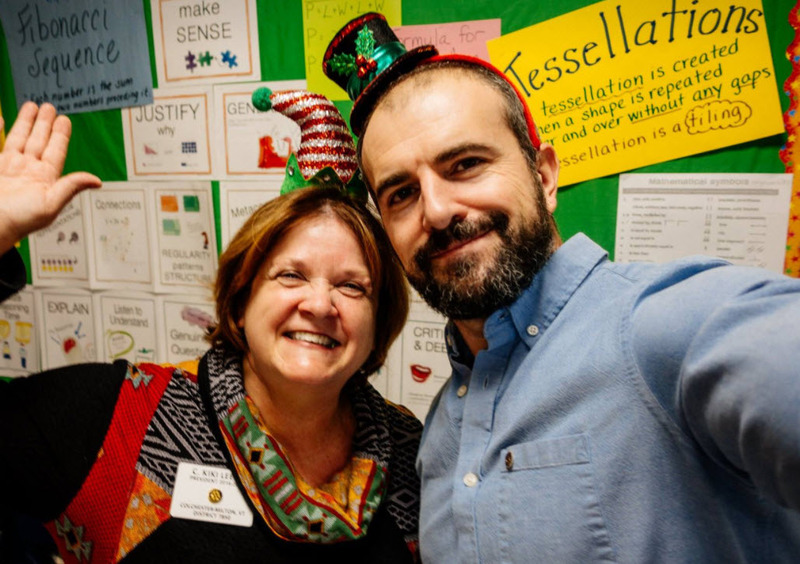 Alison, Steve, and Todd visited the school this year, and they had a great time meeting the kids, telling them about Rotary, and why our club has chosen literacy as an area of focus. #1 - Write your name on the inside cover under the Rotary sticker. #2 - Highlight words you don’t know when you look them up. 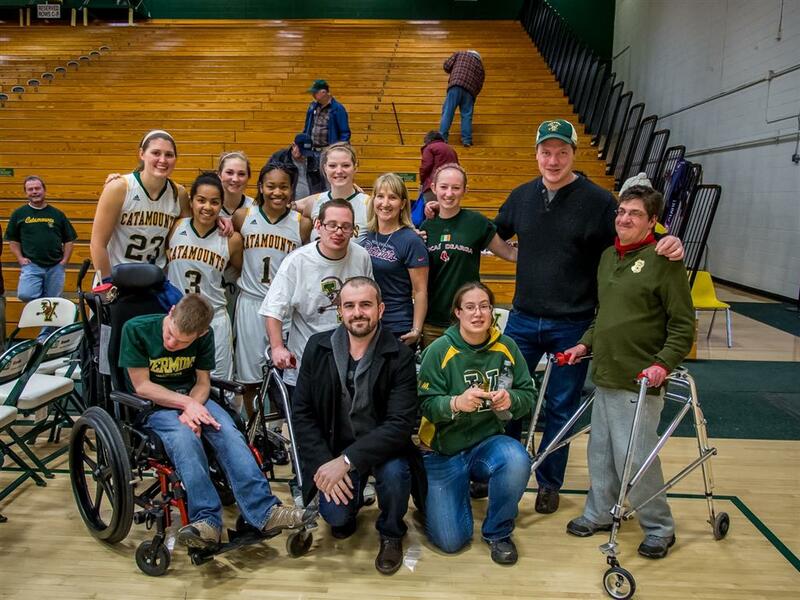 #3 - Always say “thank you!" Since Todd became involved with the project three years ago, the kids have also gotten a bonus geography lesson when their Rotarian friends come to visit. Todd was born in Bulgaria, and he always challenges the children to find his birthplace on the map! 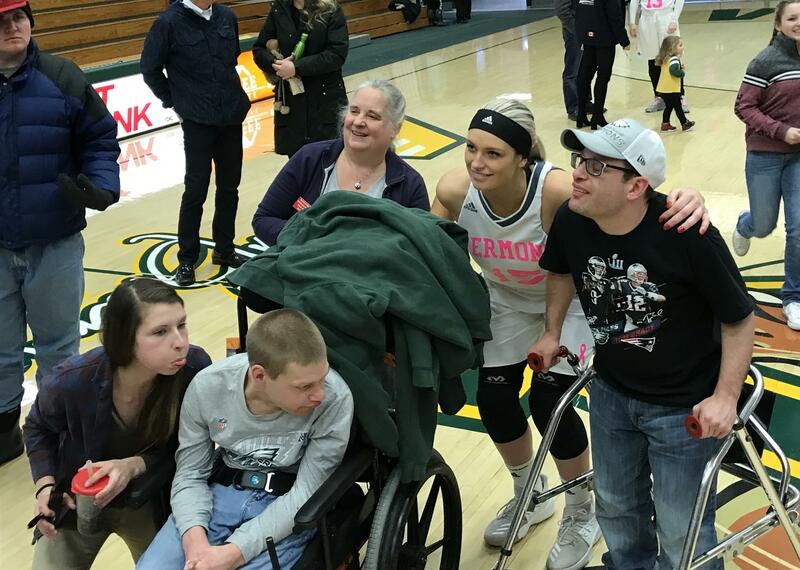 On Saturday, January 18th, Burlington Sunrise Rotary joined 28 of our friends from Partners in Adventure to cheer on the Catamounts as they battled UMBC. The ladies were victorious and a good time was had by all. After the game, some of the players stopped by to sign autographs and chat with the group. Lt. 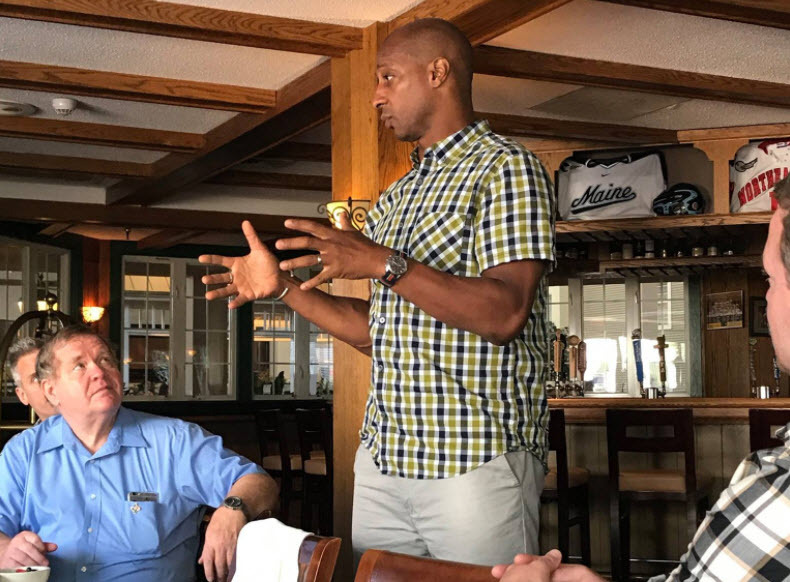 Governor Scott spoke to the Club about his ongoing efforts for our state, and his role as a conservative politician in an otherwise liberal Vermont administration. 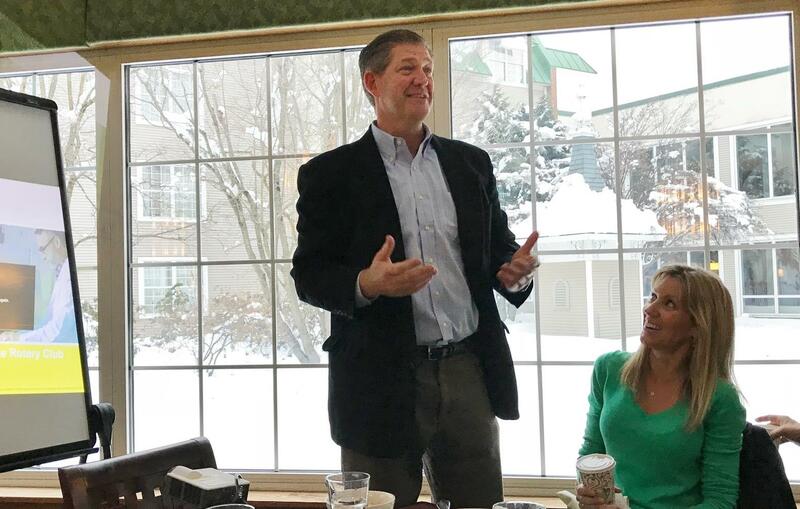 Burlington Sunrise Rotarian Ken Puzey has launched the Kenya Safe Water Project with the goal to provide people in Kisumu, Kenya with a sustainable method for creating safe drinking water –helping to create a healthier life! These Rotarians are Serving Up Something Good! Thanks to Laura Bowe for getting us in touch with the Burlington Parks and Recreation Department to assist with their annual Senior Picnic at Oakledge Park It was a beautiful day to be in the sun, enjoying good food, fun entertainment, and great company! 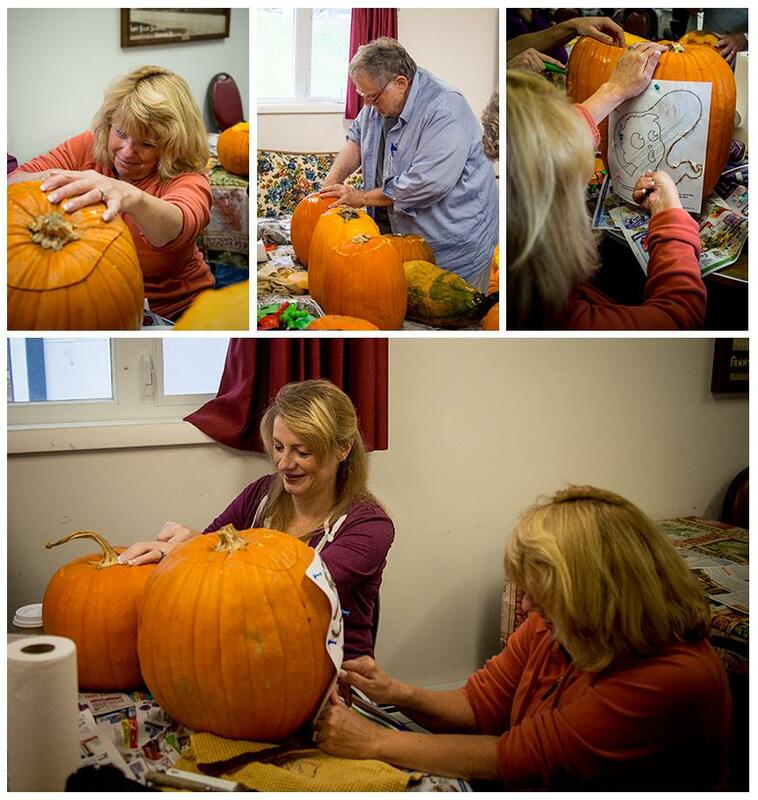 The Sunrise Club gathered at the Winooski Senior Center on October 27th to help carve the 800 pumpkins that will be on display in downtown Winooski next week in celebration of Halloween. It would seem that there's something about giant orange squash that really gets our creative juices flowing! We are happy to annouce the induction of new member Sheila Hobbs on 1/1/2011. 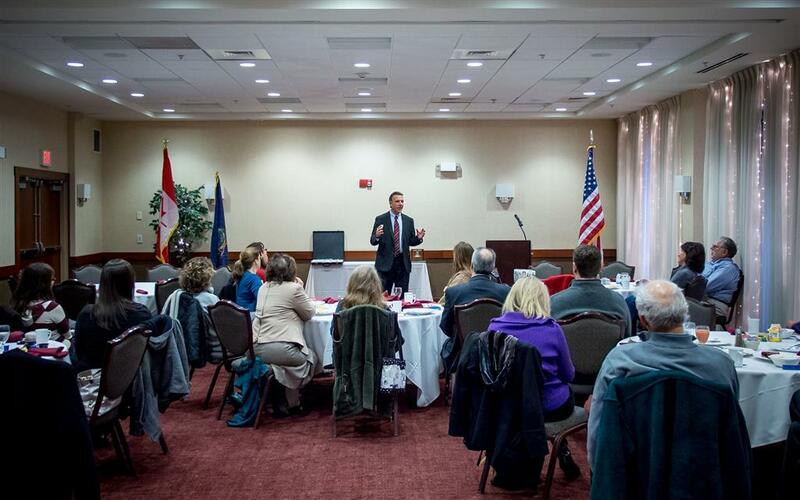 A group of 25 community minded individuals make up the Burlington Sunrise Rotary Club. Since it's inception in March of 2002 this group of members listen to, act on, and work to the betterment of inhabitants within and beyond where they live.